Wizards of Once: Twice Magic is the second instalment in the bestselling series The Wizards of Once by the unstoppable Cressida Cowell. Your children will already know of her as the author of How to Train Your Dragon and the 8 million copies sold world-wide are testament to the fact that she can tell a great story – The Wizards of Once series is no exception. In Wizards of Once: Twice Magic we are re-introduced to thirteen-year-old Wizard Xar who has a slight problem with following the rules. As it happens, bending the rules has landed him in the Gormincrag Rehabilitation Centre for the Re-Education of Dark Magic and Wicked Wizards. He’s not taking it lying down however, in fact he is dangling fifty feet above sea level from one of the prison windows in an effort to escape. That’s not Xar’s only problem: on his hand is a Witchstain. In an effort to use the magic of a witch he mixed witch blood with his own, making him a danger to himself and everyone else. Teenage Wish, who is a Warrior, also has problems with authority and magic powers. Warriors generally speaking are opposed to magic, but it appears that Wish not only has magic but it’s a special kind that is highly desired by Witches. When Wish and Xar meet up again and join forces to solve the problems that are unfolding in the Wildwoods, an action-packed adventure begins to unfold. Can they stop the witches? Will they start a war? And how are they going to stop the evil forces that have been unleashed and make things right again without making their parents extremely mad? 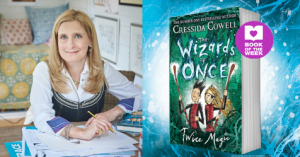 Cressida Cowell is the author and the illustrator of the bestselling How to Train Your Dragon and The Wizards of Oncebook series, and the author of the Emily Brown picture books, illustrated by Neal Layton. How to Train Your Dragon has sold over 8 million books worldwide in 38 languages. It is also an award-winning DreamWorks film series, and a TV series shown on Netflix and CBBC. 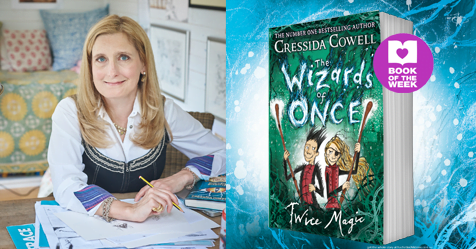 The first book in Cressida’s new series, The Wizards of Once (also signed by DreamWorks), is a number one bestseller. Cressida is an ambassador for the National Literacy Trust and the Reading Agency, a Trustee of World Book Day and a founder patron of the Children’s Media Foundation. She has won numerous prizes, including the Gold Award in the Nestle Children’s Book Prize,the 2017 Ruth Rendell Award for Championing Literacy, the Hay Festival Medal for Fiction, and Philosophy Now’ magazine’s 2015 Award for Contributions in the Fight Against Stupidity.